Today is THE day! It is the Taylored Expressions February new release day. All the new goodies are available for purchase today at the Taylored Expression store. There are eight new stamp sets, seventeen new dies and and embossing folder. And all of them are spring and Easter themed! Did you check sneak peek of all the products? If now head over to Taylored Expressions blog and get inspired. 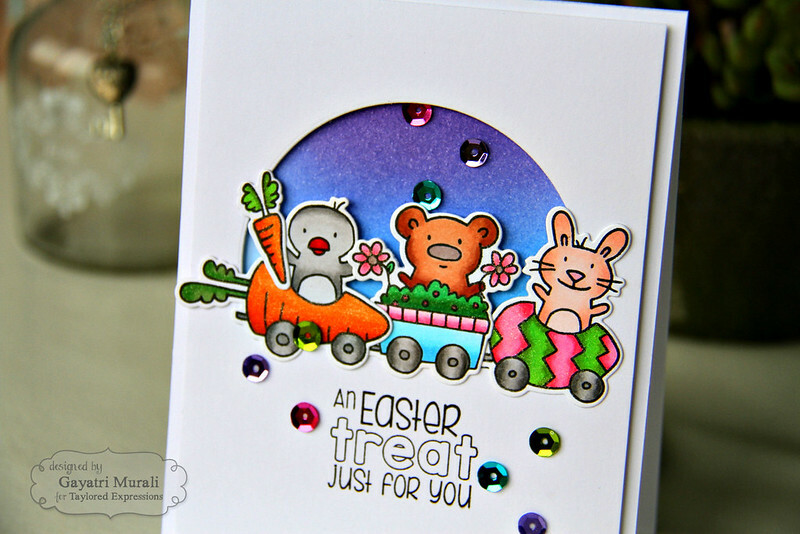 Today I am showcasing Bunny Tails and Happy Trails stamp set and coordinating dies. How adorable are those images? And I LOVE the mixed font sentiment. Fun set to have in your collection. I have two cards to share with you today. I loved copic colouring the images from stamp set. Then used the coordinating dies to die cut them out. I then die a partial die cutting of a circle using Stitched Circle Stacklet on a white cardstock panel. On a white card base, I masked and sponged Salty Ocean, Mermaid Lagoon, Blueprint Sketch and Seedless Preserve distress inks. I then adhered the partial die cut white panel on the card base using foam adhesives. I adhered the three die cut coloured images over the bottom of the partial die cut circle. The sentiment is stamped beneath the die cut images. Finally embellished with Rainbow Bright sequins and brushed the images with clear Wink of Stella. I then used the last coloured and die cut image from Bunny Tails and Happy Trails stamp set to make another card. 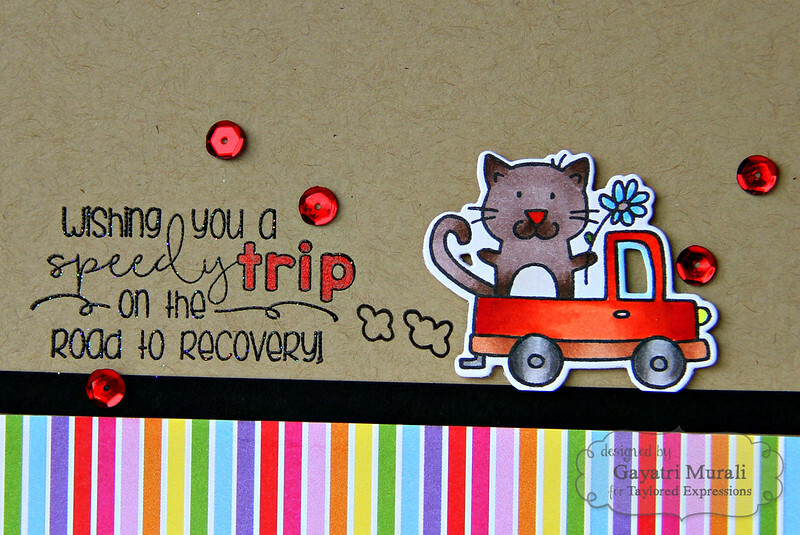 There is also this sentiment in the stamp set to make a get well card. The rainbow pattern paper is from Taylored Expressions Rainbow Bright 6×6 pattern paper pad. I added a strip of black cardstock over the pattern paper to make it look like a road. Adhered the coloured image on top of the black strip, black heat embossed the sentiment to the left of the image. I coloured the “TRIP” with red copic. Then finally embellish with red metallic sequins from Rainbow Bright sequins. 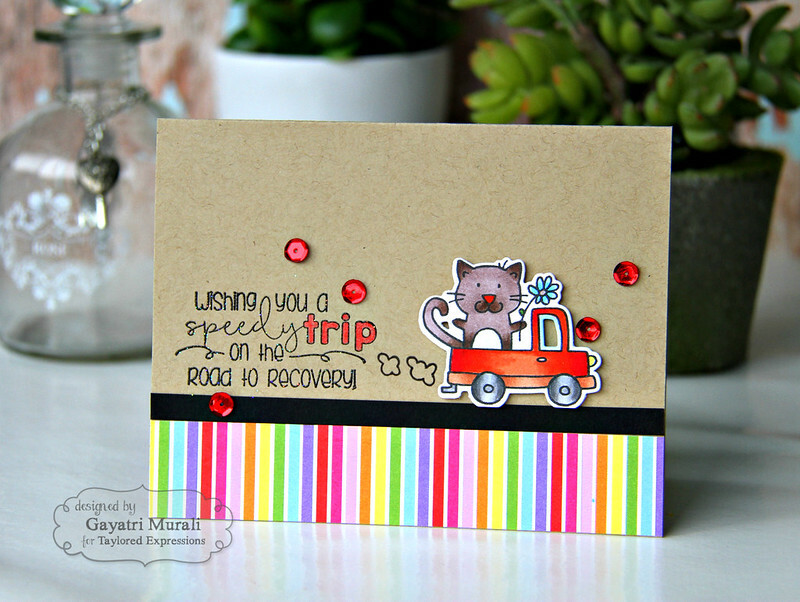 Hope you like my cards using the new Bunny Tails and Happy Trails stamp set and coordinating die set. All the new release stamp set, dies and embossing folder are available for purchase from Taylored Expressions shop. Check out Taylored Expressions blog for more inspiration from Taylor and other design team members. So, so cute! I just love the background on the first card! These are so darn cute Gayatri, your colouring is brilliant! These are both darling, Gayatri! Love the background on the first and the added shimmer! Beautiful cards!! Love the first one!! Very cute! 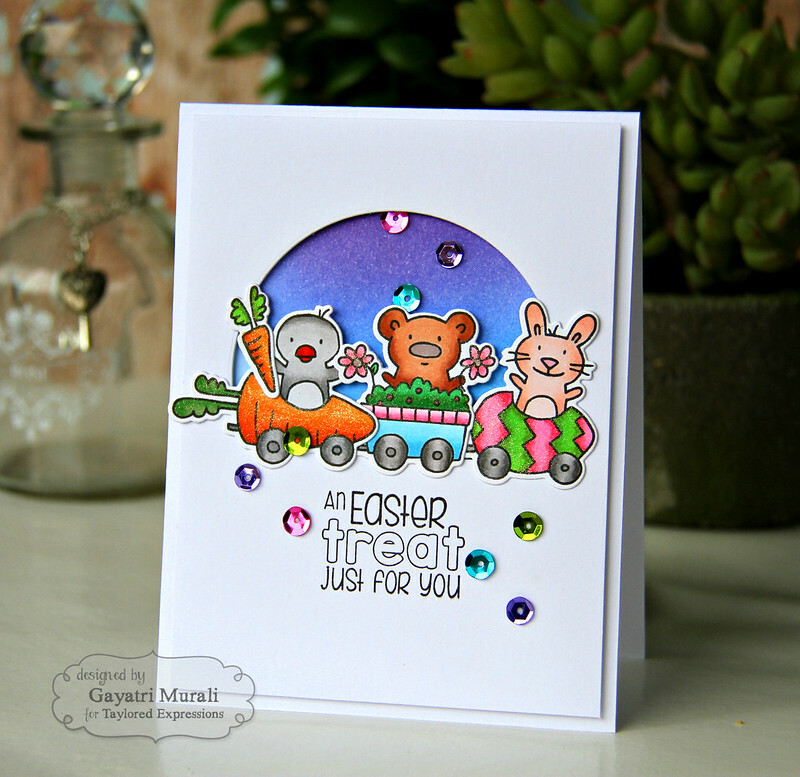 Great cards, Gayatri! Love the partial die cut circle on the first and the colored background. Fun second card. Thank you for sharing.